Because there is a double creation. Through the reproduction of a work of art we relive the creative process of the artist, we appropriated ideas, shapes, colors and then transformed and reinterpreted. In all these artists (among my favorites) for reasons that I can not fully explain, I perceived a way all of them to get in touch with the inner child. If this is evident for artists like Basquiat, Calder, Matisse and Gondry, the matter seems more complicated for Hopper and Tarantino. Yet Hopper with his desolate atmospheres can refer to an aspect of the loneliness of childhood, while Tarantino, as we know, in his films cites images and themes taken from his pop culture learned as a child. "Childhood is not a time but a 'temple' that is a place, 'the playroom'". A. Savinio. 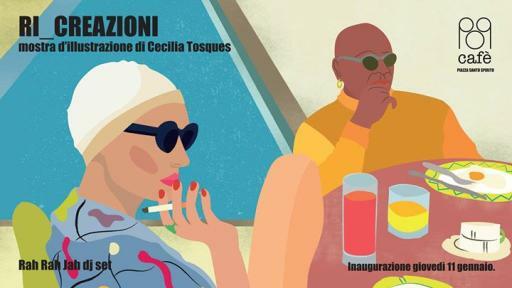 CECILIA TOSQUES was born in Florence in 1985 from a Florentine mother and a New York father. As a child she is fascinated by pop culture, which is approached through television, her father's old vinyl records and her mother's books, in this way music, film and stories feed her imagination more and more. His path of study then enriches his artistic and cultural skills, passing from the graphic analysis of the drawing to the study of the history of fashion, art and illustration. Then the need arose for her to find a more intimate and personal dimension and that is how she first started producing collages and then evolving into illustration.